Vietnam successfully hosted APEC 2017 right at the time of reviewing 30 years of attracting foreign direct investment (FDI). After 30 years of opening, the FDI sector has become an important growth driver for the economy, in the indispensable trend of strong global integration and Fourth Industrial Revolution. To draw capital in general and FDI in particular, localities are entering a “fair race” to attract investors and they can only win with their own advantages over others, in addition to government policies. Re-established in 1997, Vinh Phuc province has emerged as an attractive destination for foreign investors. It has been among the few provinces to self-balance budget incomes and outcomes since 2004, and among the biggest budget contributors in the north. Positive changes in investment attraction in Vinh Phuc province are the result of continuous efforts and strong political will of provincial leaders in general and investment authorities in particular. Since its re-establishment, the party and government of Vinh Phuc province have seen business environment improvement and investment attraction as priority political tasks. As for the province, investors in Vinh Phuc are citizens of Vinh Phuc and their success is also that of Vinh Phuc. Accordingly, the province always provides the most favourable conditions for investors, promptly removes difficulties and problems against them and flexibly applies State policies based on local reality. With that determination, Vinh Phuc has created its own strengths and differences in investment environment. Specifically, in Vinh Phuc province, investors need to go to only the Investment Promotion Agency to submit all investment and business-related documents. This single-window mechanism reportedly reduces, by a third to a half, the average regulatory time duration of Vietnam. English, Japanese, Korean and Chinese translators are available to assist foreign investors. As for planning, Vinh Phuc has territorially integrated and closed planning for sustainable investment. The master plan for socioeconomic development as well as sectoral and field development plans has been completed. Construction planning has been territorially closed. General urban planning to 2030, with a vision to 2050 executed by Nikken Sekkei Engineering Civil Ltd (Japan) was approved by the Prime Minister of Vietnam in 2010. With respect to infrastructure readiness, provincial and district administrations have specialised agencies responsible for land compensation and clearance to create land funds for investors to carry out their projects. Modern socioeconomic infrastructure has been invested in both urban and rural areas in order to make full use of advantages of geographical location and convenient transportation: Lying in three key development areas and having national road and rail traffic systems, having access to the Trans-Asia road and lying near Noi Bai International Airport. In the past time, Vinh Phuc has made good use of infrastructure support projects funded by the World Bank (WB), the Asian Development Bank (ADB) and Japan. Regarding human resources, Vinh Phuc currently has a golden population structure, with 62 per cent at working age. Over 50 per cent of workers are trained. Thus, FDI enterprises have chosen Vinh Phuc as their investment destination because the province has a developed industry, an abundant labour force, a developed infrastructure and a noteworthy effort in improving investment and business environment. According to the Provincial Competitiveness Index (PCI) 2016 released by the Vietnam Chamber of Commerce and Industry (VCCI), Vinh Phuc was ranked among the Top 10 out of 63 provinces and cities. Its PCI rankings jumped from the 43rd position in 2012 to the ninth position after just four years. This is the clearest evidence to ongoing efforts in improving the investment and business environment and enhancing competitiveness to optimise advantages in investment attraction, especially FDI. In recent years, investment promotion and support has been a priority of Vinh Phuc province and is considered a main solution to lure foreign direct investment. 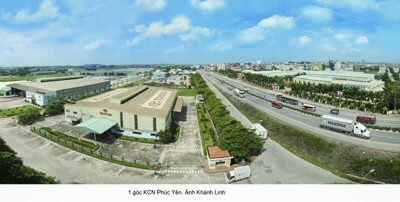 From its re-establishment to 2012, investment promotion and support was assigned to the Vinh Phuc Industrial Zones Authority. In 2012, Vinh Phuc established the Investment Promotion Agency (IPA) under the Provincial People's Committee to carry out this task. Vinh Phuc has regularly reformed investment promotion activities; improved the quality and effectiveness of investment attraction projects; and approached target domestic and foreign investors to provide information and call for investment. The province has organised sector-specific investment attraction activities in foreign countries instead of hosting large-scale general events. The province has selectively attracted investment projects, limited projects using much land and generating low added values; resolutely rejected projects using too much energy or posing environmental pollution risks. As for investment promotion, the province has gradually combined it with trade promotion and tourism promotion to reduce expenses. Since 2014, the province has drafted and issued annual investment promotion programmes based on regulations of the government. Therefore, investment promotion has been deployed consistently, closely guided by the Provincial Party Committee, the Provincial People’s Council, and the Provincial People’s Committee, and closely coordinated by specialised agencies. In addition, the province has made a list of projects in need of investment capital in given times and periods. Communications on local investment and business environment have been organised via various information channels like on the internet and on central and local mass media, with the main instrument being its investment promotion website where investment promotion documents are displayed in five languages: Vietnamese, English, Japanese, Korean and Chinese. It has integrated promotion and introduction of local investment and business environment via domestic and foreign events; coordinated with domestic and foreign investment and advisory organisations to provide its information for investors; hosted domestic and foreign investment promotion seminars, forums and meetings in Japan, South Korea, Europe and America to provide information on investment environment and business opportunities in Vinh Phuc. In particular, Vinh Phuc has put a premium on on-site investment promotion by actively supporting investors and businesses to tackle difficulties. It has taken good care of current investors to assure them of doing business and expanding operations in the province. Many business support forms have been launched like accelerating administrative reform; settling administrative procedures in the single-window mechanism at the Investment Promotion Agency; quarterly conducting surveys to grasp situations and hardships of enterprises; surveying business satisfaction with State agencies at all levels; establishing and maintaining the operation of the Business-Government Dialogue Information Portal; and hosting business meetings on Fridays to learn about existing concerns and hardships of enterprises to seek best solutions. Indeed, successful investors and companies in the province will recommend the province to new investors. Vinh Phuc has become the headquarters of many world-leading automobile and motorbike manufacturers in Vietnam such as Honda, Toyota and Piaggio, as well as giant industrial companies. In 1998, Vinh Phuc had only eight FDI projects, but it was home to 265 valid FDI projects with a total registered capital of more than US$3.75 billion as of December 2017. Vinh Phuc has gradually become an automobile, motorcycle, electronics and telecom industry development centre in the north of Vietnam. Toyota, Honda (Japan), Piaggio (Italy) and Daewoo (South Korea) successfully invest in manufacturing and assembling automobiles and motorcycles in Vinh Phuc province. Some giant electronics corporations such as Canon (Japan), Samsung (South Korea), Foxconn and Compal (Taiwan - China) have invested in Vinh Phuc and neighbouring provinces and cities where supporting industries such as mechanics, electronics, informatics and telecommunication have the opportunity for development. FDI projects have increased rapidly in both quantity and quality, contributing significantly to provincial budget revenue. From 1997 to 2016, the province’s budget revenue rose by 300 times, from VND100 billion to nearly VND30 trillion. More than 20 years after re-establishment, FDI is an important catalyst to local economic growth. In addition to positive results, the FDI sector still has some existing shortcomings and limitations needed to overcome in the coming time, for example, the low rate of FDI in total investment and worse-than-expected technology transfer. From its successes and shortcomings, Vinh Phuc province will continue to strengthen its economic restructuring, improve economic competitiveness and sustain economic development. In the long run, the FDI sector needs to play a greater role in local economic development. By 2020, Vinh Phuc will lift the FDI sector to a higher position by raising the potential and level of technology and production and create higher added value instead of just manufacturing, assembling and processing products as now while adding the value to products made in Vietnam. To do so, the province will try to attract 85-90 new FDI projects with a total registered capital of from US$750 million to US$1 billion in 2018-2020 and raise FDI disbursement rate to 65 per cent of registered capital by 2020.